gCaptain is reporting that the Army will be divesting itself of most of its watercraft. As stated in the Army’s Memo initiating this decision, “Army Watercraft Transformation Through Divestment of Capability and Force Structure by Inactivation of Units”, the intent is to “eliminate all United States Army Reserve and National Guard Bureau AWS (Army Watercraft Systems) capabilities and/or supporting structure… eliminating nearly 80% of its present force”. 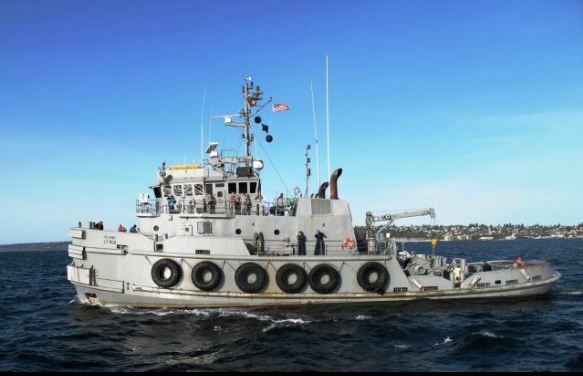 The Major General Nathanael Greene class large coastal tug USAV Major General Henry Knox (LT-802) assigned to the 467th Transportation Company in Tacoma, Washington. Some of the shallow draft transports might be adaptable as inland tenders. The fleet also includes 16 ST-900 class pusher tugs, 109 tons (light), 59.7 x 22.6 (22 at the waterline) x 6.7 feet (18.19 x 6.9 (6.7 at the wl) x 2.03 meters) completed 1998 to 2007, as well as a number of barges of various types. . 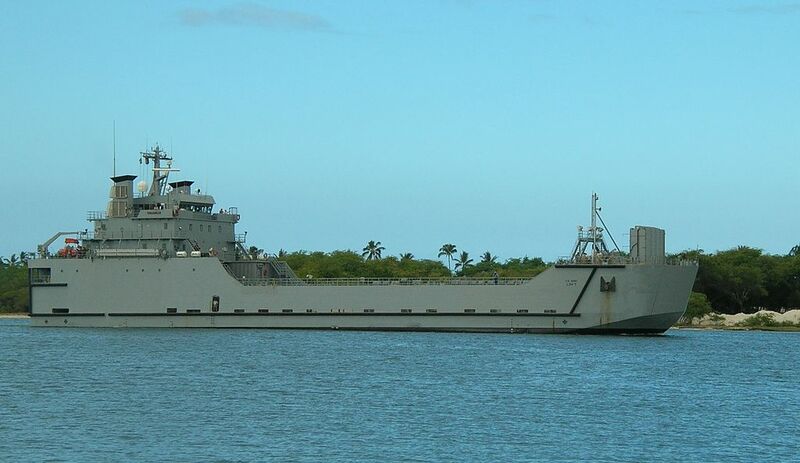 The Army 6,000 ton, 315 foot logistic support vessel SSGT Robert T. Kuroda, completed in 2006, at its home port of Honolulu, Hawaii, after a 5,000-mile delivery voyage from Pascagoula, Miss.Some of the larger vessels, like the SSGT Robert T. Kuroda (above) and her sister ship, might be converted to be used as mother ships to support remote Webber Class FRC operations in the Eastern Pacific or Southern Caribbean. They might also be useful in disaster response. One or two of the Crane barges might find a home at the Coast Guard Yard. The Army has recently let a contract for new landing craft, (also here) no indication what will happen to the contract or the vessels, but it does not sound like it will get beyond the design phase. Landing craft that can be beached, requiring no piers for unloading, might be useful in disaster response. This sounds bad but, I think the vessels to be reduced are the older LCUs which are being replaced by the new MVS-L. And it sounds like the Reserve Component is to cut more drastically? BUT more significantly it shows that the Army is seriously reduced its Maritime Force which would limit the Army’s response to DR in CONUS and HA aboard. There are other agencies which MIGHT get tasked to take up the slack? Looking at these as national assets vs. service-specific, it is painfully obvious the LSVs should be diverted to MPRONs or to the Amphibious Force. Now the Tugs… Yeah, those would be fantastic “free” upgrades, as long as they are in decent shape, for the Coast Guard. My favorite group would be the Caribbean Community or the Organsiation of Eastern Caribbean States. Not sure the Navy will embrace the 6 smaller and 2 larger LSVs. Chances are the smaller ones get sold or donated to allies, possibly some in the Caribbean for HA/DR missions. The 2 larger LSVs could also easily find homes abroad. USCG could easily adopt the tugs. Wouldn’t be the first time 2nd hand equipment could be put to good use! I am hoping the CG might take over the two larger, more seaworthy LSVs and use them to support a squadron of FRCs in the Eastern Pacific. Alternately, would be very useful for disaster relief work. Maybe add a flight deck and hangar. In the event the LSV (2200 ton payload) and LCU (350 ton = 5x M1 tanks) assets are transferred to the MSC in turn making them national assets this is understandable. But if they are put in mothballs or given away then it shows how broken the department is. But it would be typical to let this opportunity pass after years of reports saying how gutted the MSC and sealift in general are. In terms of transferring the LSVs to the Navy, I don’t believe the LSVs were designed to operate in a contested environment. They were intended to to assure ship to shore logistics in an austere or damaged port environment. As such I’m not sure the Marine Amphibious Force will find them up to their standards. Moving them to the MSC would keep the capability in place, while having them be staffed by a civilian authority… Which in turn could have some advantages. Note: Philippine Navy has two LSVs that they have modified with an aft deck helicopter landing platform and a hard cover over half of the front storage bay (see wikipedia for pics). This is why I see them as ideal additions to the MPRons. They would be stationed with the ships carrying forward-located equipment and would expand the capability of deploying that equipment from fully-functional port facilities to also damaged ports or over-the-beach. Granted, the beach may need to be secure already, but that’s what the PhibRons and Marines are for. Desert Shield, and hence Desert Storm, only succeeded because the Saudi Ports were undamaged and the MPRON ships, and later, Merchant vessels, brought in all the heavy equipment through those perfect ports. And while these ships supply low capacity (they are not Mulberry harbors), they provide useful capability which otherwise doesn’t exist.